Every single famous person you could possibly think of, and some that you probably forgot about, came together Tuesday night to answer phones and smile for the cameras, as they helped to raise almost $44 million for relief for the victims of Hurricane Harvey and Irma. As is the nature of these things, the telethon was live, uninterrupted by commercial breaks, and sprinkled throughout with various performances by random assortments of artists—like a sad and philanthropic Grammys. Stevie Wonder opened the show with a rousing rendition of “Lean on Me,” backed by a gospel choir, and ended his performance by saying,“As we begin to love and value our planet… anyone who believes that there is no such thing as global warming must be blind or unintelligent. Lord, please save us all.” The current administration has removed language about climate change from its website, so now it’s taking celebrities like Wonder and Beyoncé to point out the obvious. The event was for an extremely good cause, but given the rarity of such a situation, it was a strange and surreal scene. Famous people who seem to only rub shoulders at industry events sat side by side, waiting for their phones to ring and mugging for the camera, which lingered over the more unusual seating arrangements. 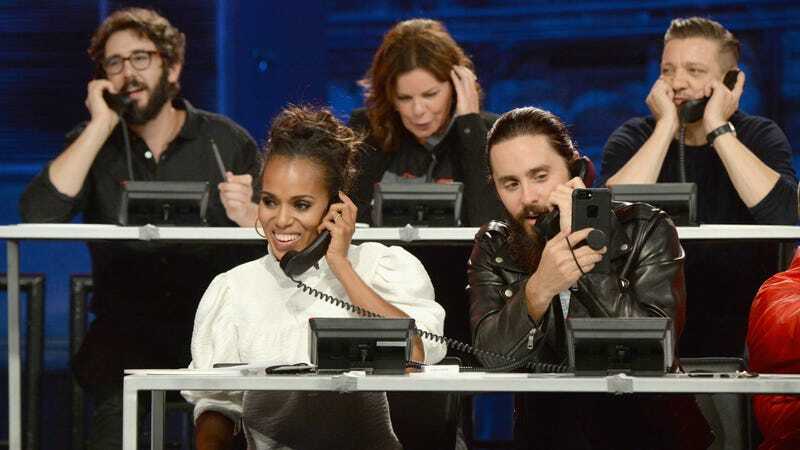 Kerry Washington, engaged in her conversation, sat next to a bearded and stone-faced Jared Leto, whose entire shtick seems to be just remaining “in character” even when he’s not working. Somehow Justin Bieber and Oprah Winfrey were seated next to each other. As the camera panned over the line of celebrities making concerned faces and scribbling notes, Bruce Willis made direct eye contact at one point, engaging the camera in a staring contest. At one point, someone put Asahd Khaled in his father’s arms—just in time for the photo op, maybe. Watching a room full of people whose collective net worth is well over double the money actually raised for hurricane relief felt a little funny—a friend texted me during the telecast that if all the celebrities in that room donated a tenth of their salary to hurricane relief, we wouldn’t have to have to endure this strange and slightly stilted pep rally. Still, the fact that these famous people are donating their time and their faces to this cause speaks volumes: celebrities are doing way more for this catastrophe than, say, Trump. This may foretell the climate to come—when we can’t depend on the government to help, we’ll have to rely on each other. The hurricanes have already affected a huge amount of people: CNN estimates that over 450,000 people will be relying on FEMA for assistance in the wake of Harvey; Irma essentially destroyed the island of Barbuda and has killed 11 people in Florida and over 30 in the Carribbean, leaving millions of people without power. Here’s a guide on how to donate.